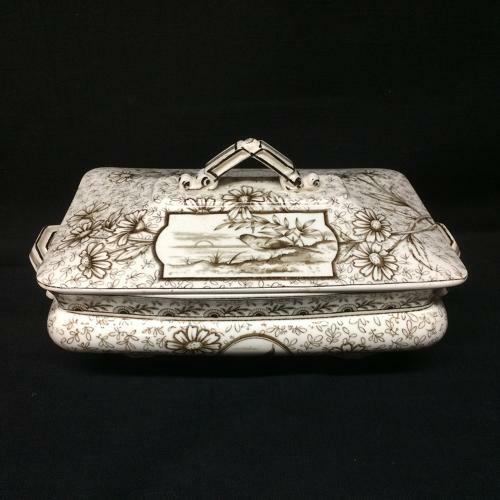 This Victorian 10 1/2 " long x 6 " wide x 5 " tall covered tureen and is transfer printed in dark brown. The pattern is very crisp and clear and features a fancy pin wheel flower border and the piece is completely covered with oversized Daisy type flowers swirls of foliage. Eleven magnificent cartouches are filled with geometric designs, Garden Birds/Hummingbirds and nodding flowers. Wow! The pieces are marked on the underside with an impressed registration mark, the pattern name and trademark that identifies the maker as Ridgways, a pottery maker working in Stoke upon Trent in the Staffordshire region of England during the 19th century. Never Used. Tiniest of chip near the handle.